NASA’s ingenuity to control microbial contamination in space caught on quickly, opening the doors for safer methods of controlling water pollutants on Earth. Carefree Clearwater, Ltd., of Cornelia, Georgia, obtained NASA’s permission to manufacture a modified version of the Space Agency’s patented Electrolytic Silver Ion Cell for numerous commercial and industrial applications, including swimming pools, hot water spas, decorative fountains, ponds, manufacturing processes, and evaporative water cooling towers. Using NASA technology, Carefree Clearwater, Ltd.’s automatic purification systems electronically release copper and silver ions into the water to destroy bacteria and algae. The Carefree Clearwater systems based on NASA’s Apollo-era technology electronically release copper and silver ions into the water to destroy bacteria and algae—which are then filtered out. Unlike chlorine, the ions do not dissipate from heat and sunlight, therefore they are capable of providing a very stable sanitizer residual. The ionization technology substantially reduces the demand for chlorine so that fewer chloramines are formed and fewer chemicals are consumed. This cuts down on undesirable side effects realized in swimming pool environments, such as burning eyes, odor, and bleached or dry skin and hair. Furthermore, the ions pose no health risks, as scientists contend that chlorine can react chemically with organic materials in water to form a class of carcinogenic substances called trihalomethanes. Numerous independent laboratory tests from NASA, health departments, and universities, and many years of field testing have confirmed the exceptional sanitizing ability of copper/silver ionization. Studies further show that using a combination of copper and silver can be effective against E. coli, Pseudomonas, Legionella Pneumophila (Legionnaires’ disease), Staphylococcus, Streptococcus, Salmonella, and other pathogens—some of which have proven to be resilient even to high levels of chlorine. 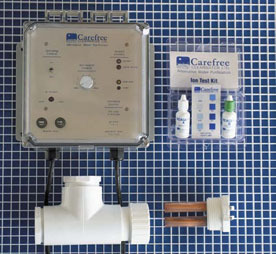 Carefree Clearwater’s automatic water purification ionizers employ a safe, low direct current, like that of several common household batteries, that passes through a set of copper and silver alloy electrodes. As the water supply traverses the ionizers’ sealed chamber, metallic ions are generated to purify the water. When these ions encounter bacteria and algae, they destroy them through an alteration in their enzyme processes. All of the charged particles then flock together, only to be pulled out by a filter. The ions uphold a stable sanitizer residual until they are completely used up by this process. The company markets several water purification products, including the Model 1200 State-of-the-Art Commercial Rated Electrolytic Ionizer and the Model 1100 Automatic Purification System. The Model 1200, which purifies 15,000 to 45,000 gallon swimming pools, features a rugged and durable design to protect its solid-state electronics from moisture, corrosion, and harsh environments; simple operating controls; light-emitting diode displays for power, polarity, and anode status; self-cleaning anode design; and an ion test kit. Variations of the Model 1200 are available for even larger swimming pools that range from 45,000 to 125,000 gallons. The Model 1100 offers many of the same features of the Model 1200, but at a lower price, since it is designed to purify spas and swimming pools up to 25,000 gallons. 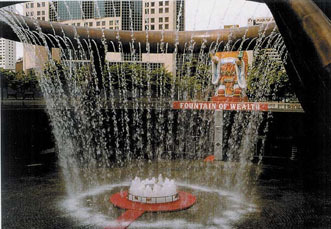 The Fountain of Wealth in Suntec City, Singapore—the largest decorative fountain in the world—employs a Carefree Clearwater purifier system. Carefree Clearwater asserts that its commercial purifier quickly pays for itself by eliminating the need to spend thousands on chemical sanitizers, algaecides, and clarifiers. Operating costs for the ion generator’s electrical consumption average less than 25 cents per month. Periodically oxidizing the water to break down organic contaminants from rain, wind, body oils, and leaf debris and maintaining a low halogen level and a normal pH balance are all that are needed when a Carefree Clearwater purifier is installed. Savings are also realized with a Carefree Clearwater purifier by eliminating bleaching and other damage to hair, swimsuits, pool equipment, and nearby plants and flowers. In addition, consumers save time, as daily testing and chemical handling are not required with a Carefree Clearwater product. The company’s purification systems have been installed in thousands of residential and resort pools and spas, YMCA facilities throughout the country, and at many major university indoor/outdoor pools, including the University of Virginia, the University of Texas, Purdue University, and Wake Forest University. Decorative fountains at Disney World, the Centers for Disease Control and Prevention in Atlanta, the John F. Kennedy Center for the Performing Arts in Washington, DC, and Kellogg’s Cereal City in Battle Creek, Michigan, are kept sanitized with Carefree Clearwater purifiers, not to mention the largest decorative fountain in the world, the Fountain of Wealth in Suntec City, Singapore. Furthermore, the Cincinnati Zoo is tapping the technology for its sea lion tank, walrus pool, and arctic bird exhibit; Zoo Atlanta is utilizing it for its tiger and hoof stock exhibits; and Alligator Adventure in North Myrtle Beach, North Carolina, is employing it in its habitat for UTAN, the largest crocodile ever to be exhibited in the United States. Outside of recreational use, the electrolytic ionizer has proven to be invaluable for industry, especially in the areas of heating, venting, and air conditioning, and where cooling towers are relied upon to remove heat from a stored water source so that the water can be recirculated and reused or safely discharged to a natural body of water, like a river. Currently, there are more than 15 million cooling towers in the United States alone. This number will continue to increase significantly with the construction of new commercial and industrial facilities. Water is the most commonly used coolant medium, and an open recirculating system is the most common type of equipment for a cooling tower Compared with other coolants, water is plentiful and inexpesive, and can carry large volumes of heat without considerable expansion or contraction. On the other hand, water can create major problems. Algae and microbiological contamination in the cooling system can lead to troubles ranging from bacterial buildup and Legionnaires' disease, to costly, extended downtime for cooling system repairs and the premature deterioration of expensive capital equipment. The National Oceanic and Atmospheric Administration, the Stamford Plaza Hotel in Auckland, New Zealand, and the Wallops Flight Facility in Virginia are a sampling of the various entities using Carefree Clearwater products to purify their cooling towers and prevent potential contamination and breakdowns. The list of applications and benefits from this NASA-derived technology continues to grow daily, validating Carefree Clearwater’s mission to establish a solid foundation and a strong future for electronic water purification.